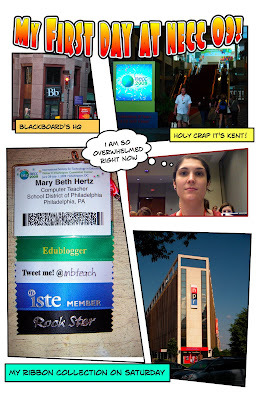 So I’m experimenting with blogging using Comic Life. I took a BYOL workshop and now I’m determined to figure out how to make these bigger to take up the whole screen. Please give me feedback!!! Of course, any future posts would have much more content. This is an experiment! MB:I'm glad you are getting the hang of Comic Life! Geesh, I'm even included in one of your first comics, yessss…I had the pleasure of running the pilot for our district this year for Comic Life and the results are amazing. Here are some resources I've created to help you connect CL to writing and the curriculum. I've created a 4 part Comic Life tutorial screencast on my http://screencast.ca video podcast. These podcasts will also play on your iPhone.The theme was "Superheros" and we used "Captain Canuck" but you could pick an American superhero.Part 1: Students wrote the narratives and created comics we could scan. 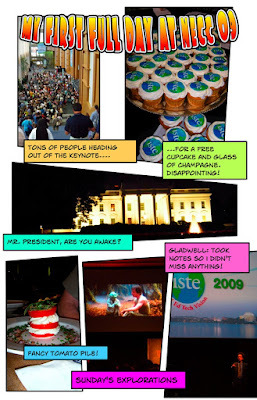 <a href="http://screencastca.blogspot.com/2008/12/c.htmlhttp://screencastca.blogspot.com/2008/12/c.html<b… />Part 2: We then had original artwork we could use in Comic Life <a href="http://screencastca.blogspot.com/2008/12/captain-canuck-pt-2-comic-life.htmlhttp://screencastca.blogspot.com/2008/12/captain-… />Part 3: We used Audacity to have students record their voice narration of the panels of their comic. <a href="http://screencastca.blogspot.com/2008/12/captain-canuck-pt-3-audacity.htmlhttp://screencastca.blogspot.com/2008/12/captain-… />Part 4: We used Movie Maker to create a "visual comic" of the narrated comics. <a href="http://screencastca.blogspot.com/2008/12/captain-canuck-pt-4-movie-maker.htmlhttp://screencastca.blogspot.com/2008/12/captain-… />The students had a blast with this project from start to finish. They were engaged during the entire process.